“Austin Eckhart has spent his life dancing. When he is hired as a dance instructor by Jessica at Sean Callaway’s Ashbury Studios, he is ready to get to work, even though his mind is focused on only one thing: helping out his brother. 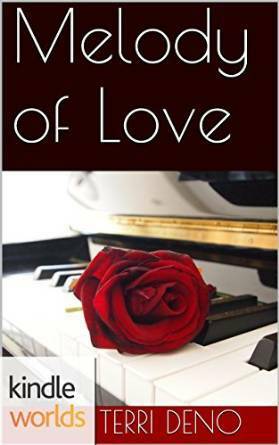 Melanie Dover is on the brink of a major pop star career as her alter ego, Melody. Although it isn’t the type of music she loves most, she’s willing to do anything to be in the music industry. With her ambitious father by her side, she’s ready to take on the world—if she could only learn the dance steps to her songs. This was a very quick read. I picked this up when I was looking for something to read over lunch and this one was perfect. It is a short and sweet read. I loved Mel as a character. She was probably like every other woman here today. Wanting to chase after her dreams and yet not being able to because of circumstances. I feel we are generally so restricted in our lives. We sacrifice our dreams and somehow come up with justifications for why our dreams should be sacrificed. It shouldn’t be that way for all of us. And that is the core takeaway. That our dreams should take precedent. And that life will sort itself out somehow. Also, I loved how sweet Austin and Mel’s romance was. Love is unpredictable and it really does not take long to fall in love, especially if it is with the right person. I am one of those people who believe that couples end up together for a reason and everyone has someone who is meant for them. The way Austin and Mel found each other was very sweet. That being said, the novel for me was too brief. It was too short. I wanted more character development. The dark side that Austin was trying to protect was not too dark and I wanted that to be more developed. I also wanted some more about their romance, and how they discovered each other. Also some more about Mel wanting to break away and follow her dreams. I liked the attempt at making a fan fiction novel. But then the thing is, I suppose I expected something more about the Callaways to fill into the book. I thought the story should have been a lot longer. I don’t know whether there is a restriction on the word count. But I felt a longer word count would have helped me to feel for the characters a bit more. I suppose I loved the characters and that’s why I feel a little short changed for getting a shorter novella when I wanted a longer one. This book made me read into Kindle Worlds and want to write something based on that. I know I write reasonably well and this would be a great challenge for me. I think the Kindle Worlds program is a wonderful program for authors who want to write and push the envelope.